length of back 13 7/8in., 35.3cm. Documents: A photocopy of the certificate of Rembert Wurlitzer, New York, dated 18th August 1959, ascribing the violin to Guarneri del Gesù. A photocopy of a letter from J. 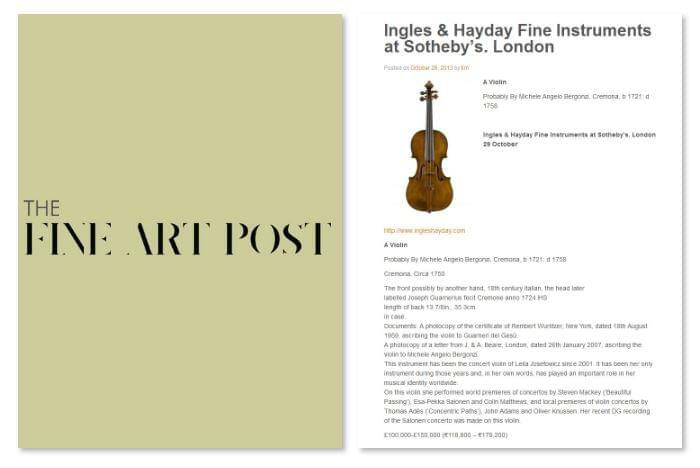 & A. Beare, London, dated 26th January 2007, ascribing the violin to Michele Angelo Bergonzi. This instrument has been the concert violin of Leila Josefowicz since 2001. It has been her only instrument during those years and, in her own words, has played an important role in her musical identity worldwide. On this violin she performed world premieres of concertos by Steven Mackey (‘Beautiful Passing’), Esa-Pekka Salonen and Colin Matthews, and local premieres of violin concertos by Thomas Adès (‘Concentric Paths’), John Adams and Oliver Knussen. Her recent DG recording of the Salonen concerto was made on this violin.